We use a large-scale internet experiment to explore how subjects learn to play against computers that are programmed to follow one of a number of standard learning algorithms. The learning theories are (unbeknown to subjects) a best response process, fictitious play, imitation, reinforcement learning, and a trial & error process. We explore how subjects’ performances depend on their opponents’ learning algorithm. Furthermore, we test whether subjects try to influence those algorithms to their advantage in a forward-looking way (strategic teaching). 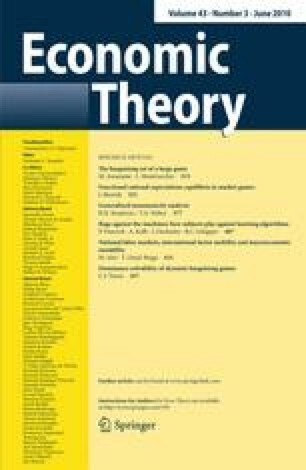 We find that strategic teaching occurs frequently and that all learning algorithms are subject to exploitation with the notable exception of imitation. Financial support by the DFG through SFB/TR 15 and SFB 504 is gratefully acknowledged. We thank two anonymous referees, David Cooper, Drew Fudenberg, Tim Grebe, Aaron Lowen, and seminar participants in Edinburgh, Heidelberg, Mannheim, Vienna, Tsukuba, the University of Arizona, and at the ESA Meetings 2005 in Tucson for helpful comments. This article is distributed under the terms of the Creative Commons Attribution Noncommercial License which permits any noncommercial use, distribution,and reproduction in any medium, provided the original author(s) and source are credited.